Make sure that Site Scan Field is installed on your iOS device and that you are logged into your account. 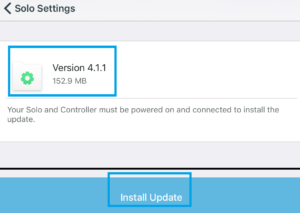 When connected to the internet, the App will automatically download the latest Solo firmware update onto the iPad so that you can perform the firmware update. 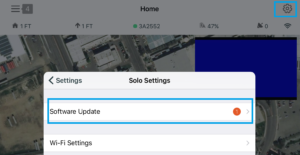 Next, connect your iPad to your Solo’s Wi-Fi network by going into the Settings menu → WiFi → and locating the correct Network. The default password for Solo’s network is “sololink”. Once you’re connected, open the Site Scan app and go into the settings menu by tapping on the gear icon in the top right corner. 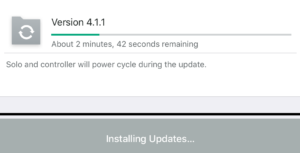 The software update option will display a red icon indicating that there is an update available. This will bring you to a new window that displays the version of the update available along with a button to initialize it. Tap the install update bar at the bottom. After you start the update the window will display a bar showing you the progress. Please allow it to finish without turning off Solo, the controller, the iPad and without closing the app. When the update finishes, both Solo and controller will power cycle. Once they’re back up, please reconnect back to the Solo’s network so that the Site Scan app can verify the update. When the verification is done, you will be notified by the app. After this the update will be finished. If you have any questions or need assistance, please don’t hesitate to contact our Success Services team on the number or email that were provided to you upon sing up. Updating firmware through Site Scan Field from 3D Robotics on Vimeo.